A total of 58 records matched your search. Pastor Michael Hoggard could not believe his eyes! As he was reading Dan Brown's Lost Symbol, he saw instance after instance where Brown was validating the teaching of the 'Secret Mysteries of America's Beginnings' videos, but especially 'Riddles In Stone: The Secret Architecture of Washington, D.C." video. Pastor Hoggard went back to the beginning of Lost Symbol, this time keeping a journal. Pastor Hoggard will demonstrate all the ways in which Lost Symbol spoke to the same issue as did Secret Mysteries and with the same definition. 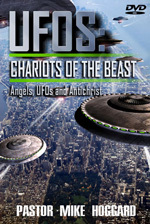 Pastor said that it seemed to him almost like Dan Brown used the Secret Mysteries' information to flesh out his plot! Three DVD Set Sale, saving you $10!! 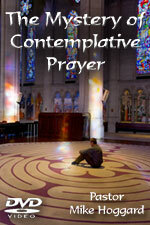 PRM-37-DVD-The Mystery of Contemplative Prayer: New Age Practice Invading Churches - Trail Leads Directly To The Vatican - DVD by Pastor Hoggard This item is on sale. The fastest growing source of Satan's influence into fundamental and evangelical churches in America is a new age, yoga-like meditation called Contemplative Prayer. Those who practice it say they hear the voice of God inside them. But is it God's voice, or the voice of a familiar spirit? In this video presentation, Pastor Michael Hoggard examines the roots of this practice and follows the trail to the Vatican and beyond. Since the trail ultimately traces back to the Roman Catholic Church, then you must understand the deeply Satanic power behind this Mystical practice. Literally, those who practice Contemplative Prayer are being led by the spirit of Antichrist, and are being used to facilitate the rise of the Beast in the last days. Pastor Hoggard nails the spiritual truth about the religion of Islam like no other! After listening to this video, you will never look at Islam the same way again! Why are the followers of Islam so constantly filled with rage? Why has Islam historically murdered so many Christians that northern Africa and the Middle East today are predominately Muslim? Why is it that the only "peace" Islam affords its enemies is the "peace of the grave"? Pastor Mike reveals that Islam is simply pagan worship of the Goddess, and that all of Islam is simply and only paganism to its very core. Pastor delves into Daniel chapter 2 to explain the secret revealed to Daniel about the 4th Kingdom,. with the mingling of the sons of God and the daughters of men as the miry clay. 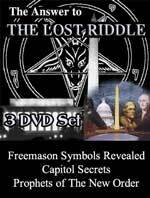 From here he proceeds into the Masonic Square and Compass and other Masonic symbols, showing how this Satanic mingling is secretly hidden in those symbols. Pastor Hoggards introduction to this material uses Deut 18:9-12 and Psalm 2: 1-3 to establish the Biblical reality that men who worship the occult regularly consult with familiar spirits so they can take counsel against God. 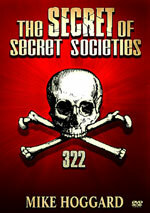 Therefore, the conspiracy by which they seek to overthrow God is demonic to its core. Hoggard also speaks about this carefully hidden secret all throughout the video and states that he will show this secret manifesting itself through Freemasonry, Rosicrucianism, the New Age Movement, plus modern movies and advertising. 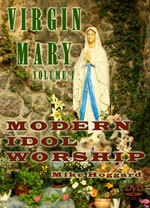 NOTE: Much of this material is taken from his DVD, 'Mother of All Secrets"
PRM-54-Virgin Mary: Modern Idol Worship DVD, Volume 1 of 2- by Pastor Hoggard This item is on sale. Why do Catholics insist upon copying the idol worship from the Babylonian 'Queen of Heaven', Semiramis? Does Heaven even have a Queen? Does she sit on Gods throne? Pastor Mike delves into the doctrines and teachings of the Roman Catholic Church, in his own exciting style, and exposes what the sacrifice of the Mass is all about, and what their iconology truly signifies according to the pure Word of God. Pastor distinguishes between the free grace of God and the Roman Catholic system of good works, almost a 'pay as you go' system. This is a call for all born-again believers to see that there is no communion between Christs church and the church of Mystery Babylon The Great. This video will solidify Scriptures in your mind and enable you to recognize the Catholic tentacles trying to wrest true believers from the finished work of Christ on the Cross. A must have video for those trying to reach Catholics in these last days. PRM-58-Virgin Mary: How The Catholic Church Rejects The Bible - DVD From Pastor Hoggard - Volume 2 of 2 This item is on sale. There is not one story of the Bible, but two. One is a history of God miraculously preserving His words through His people. We know this Bible to be the King James Bible. This beloved Bible has poured the power of the Holy Spirit through the unsaved peoples of the Earth for 4,000 years, saving untold multitudes for eternity. The other "Bible" comes from Satan using the Roman Catholic church to pervert God's words through her "scholars." The Devil used the familiar and friendly form of the old pagan goddess, the Virgin Mary, to spin a web of spiritual deceit which began with a perversion of the Holy Bible. You will see that this perversion of the Mother of Jesus into a pagan goddess Mother of God is really essential if Satan is going to complete his prophesied final deception of the entire world so that the False Prophet -- a Roman Catholic Pope -- will be able to arise to lead the vast majority of the peoples of the world into an eternally fatal worship of Antichrist. Presenting in a down-to- earth style, Pastor Hoggard shows that the Bibles Rome gave us are really clever counterfeits, designed to eliminate God's preserved words in English, the KJV. You will see why the KJV is the only Bible you can trust. 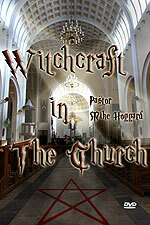 PRM-52-Witchcraft In The Church - DVD by Pastor Mike Hoggard This item is on sale. The stories of witchcraft, sorcery and the dark arts are regulated to the pastmythological fantasies that have no bearing on our technological ageor do they? Pastor Mike Hoggard shows discerning Christians that witchcraft is alive and well, has infiltrated our current society at large, but more importantly, has crept into our churches. What are the principles of Wicca that churches and church leaders are endorsing by word and practice? Which popular teachers are touting the Law of Attraction, Elemental Forces, and repackaging the rituals of witchcraft with Christian-sounding words? If you desire to worship God with spirit and truth, you will want to listen to this video; Pastor Hoggard does not hold back, but exposes this deadly trend that not only obscures the true gospel message, but will literally damn its adherents to hell. Truly an eye-opener for those seeking the real Jesus. The purity of the Christian Faith has been soiled, possibly beyond repair in the short time before Jesus returns! All Christian leaders who have allowed their ministry to stray even only a little bit from the Truth of the Word will stand guilty before Jesus Christ of being a 'worthless shepherd'.